Utilising our Cellsonic equipment, this specialist, safe and highly efficient range includes systems for cleaning Anilox rollers and gravure cylinders, press parts/general parts, silk and rotary screens and plate cleaning units. All models incorporate a patented frequency sweep generator. 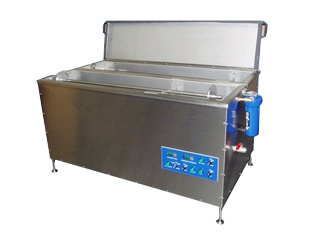 Additional options include multi-roller units, pump/filtration, rinse tanks, lids and baskets. Systems are built to meet individual customer requirements and feature our patented high efficiency ultrasonic technology. We recognise that in order to maintain print quality and prevent cross contamination, it is also necessary to clean press parts such as trays, doctor blade chambers, splash guards and ink tanks. 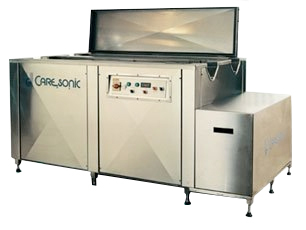 To meet this requirement, we provide a full range of ultrasonic parts cleaning systems. These range from a single item unit to multi-part systems, all using a water-based cleaning solution. The principle of using ultrasonics for the cleaning of fine screen rollers and the development of our frequency sweep system has benefited not only engraved roller cleaning but also screen printers (flat and rotary screens). We provide units for both cleaning and stripping screens. Other applications in the print industry include polymer plate cleaning. We have researched and tested ultrasound cleaning of fine screen polymer plates with a great deal of success, together with developments in the use of ultrasound for de-foaming and dispersion of inks and coatings.